They are my men, and I will bring them back! The first step I took when I began researching the Citadel War Dead interred or memorialized in Europe and North Africa, was to determine if there were any Citadel Men at the Netherlands American Cemetery which is located at Margraten about 40 miles from my home. 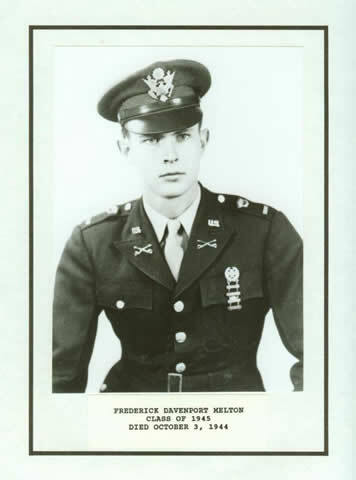 There are eight, and I was immediately struck by a single name – Frederick Davenport Melton, Class of 1945. It struck me because I recognized the last name of my Citadel classmate, N Company brother, and senior year roommate is also Melton – Paul Melton, ’89. I felt an immediate, tight bond, and this connection has drawn me to Margraten ever since. As I continue to learn more about Fred the bond grows stronger. Our lives have become more intertwined. This past Spring, I had my first contact with his family back in Georgia, and, on Memorial Day, I met the Dutch woman who visits his grave. They are all wonderful, caring people. When I think of Fred – and I think of him often…daily – I think of his bravery during the last few minutes of his life. He was a strong, brave, young man, barely twenty. His actions were valorous. Selfless. He remains a great inspiration. A tremendous role-model. A heroic leader. A Citadel Man of the highest order. Attached to this letter is photograph of my son, Lt. Frederick Davenport Melton, one-time cadet at the Citadel, who was killed in action in Germany, just across the Holland border, on Oct.3, 1944. Lt.Melton is buried at the U.S.Military Cemetery at Margraten, Holland. It might be of interest to know that the Dutch Reform Church of Sittard, Holland, near there has adopted his grave and keeps it up. It happened that as the 113th Cav Rec Sq., moved up Fred spent the night in Sittard with the pastor of that church. The church holds memorial services for Fred every year. It might also interest you to know that Fred was the youngest commissioned officer in the U.S. Army. He received his commission at Fort Riley shortly after he had reached his 18th birthday. He was the type of officer and soldier of whom The Citadel can well be proud. Mrs. Melton and I join in wishing you continued health and happiness.You are doing a great job at The Citadel, just as you did with the AEF when I had the honor of serving in the 325th Inf., 82nd Div. which was in your corps during the Argonne campaign. Thank you for your letter of August 23 and for the splendid photograph of your son, Frederick Davenport Melton. We are very happy to have the information about your son’s expected gallantry in action and leadership which he showed. This is very valuable to us, almost as much so as the photograph. I trust that you and Mrs. Melton may find it possible to visit The Citadel perhaps this Fall. Parents’ Day is November 6 when our team plays George Washington in the new stadium. Certainly no one could be more welcome than the parents of a Citadel man who gave his life for his country.